Crossway LE intercity bus | TEZAS servis a.s.
IVECO Bus has a century of experience in the transportation sector and is one of the prestigious leaders in the category of intercity buses, too. This is evident from the reliable CROSSWAY Low Entry bus designated for long distance public transport. CROSSWAY Low Entry is a modern intercity bus with a spacious interior. It meets the requirements of bus operators for the reduction of operating costs, where the reduction of fuel consumption is a primary trend. Capacity of 37 – 53 seats. Possibility to choose from 3 length versions. Choice of 2 diesel engines. Low entry height for simple boarding. Ergonomic interior for passengers’ comfort. Cursor 9 EURO VI, with capacity of 265 kW. Tector 7 EURO VI, with capacity of 235 kW. 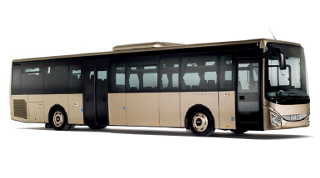 The CROSSWAY LE intercity bus offers optimum accessibility and transport capacity. It offers premium comfort for the passengers and the drivers, with even better ergonomics for a comfortable journey. The low height of the floor between the front and middle doors provides easy access for passengers. CROSSWAY LE can be equipped with manual or electric ramp and a special area for disabled passengers.